I made this dish twice to get it right. The first time, I was going for salsa. It had hot peppers in it, vinegar, oil and sea salt. The second incarnation was more of a fresh fruit salad. Both were mellow, juicy and crisp little concoctions, like a summer cocktail. When I finally decided on the right balance of flavors, I hit a wall on what to name it. Salsa, or salad? Then again, what is the difference — really — between a chunky, pico de gallo-style salsa and a finely chopped, tabouli-like salad. They were one and the same. So call it what you will, but this recipe’s a simple, summery marriage of both worlds. Second of all, I want to thank everyone who chimed in on my eggplant dilemma on the last post. I have learned so much more in about eggplant allergies in the last four days thanks to it — which would have never happened on my own. 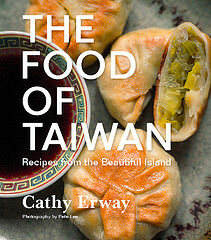 Namely, that discovery about eggplant being particularly prickly when not cooked to a mush. This might be obvious to some people, but it went off like a light bulb in my head. I don’t think I’d ever roasted eggplant to that degree of al dente-ness before. This melon-cucumber salad has only a few ingredients, all of which were found at the Farmers’ Market except for the lime, oil, salt and pepper. It’s a particularly good time for the melons. I smelled several cantaloupes at a vendor’s stand and each one of them filled my nostrils with a fresh, slightly floral fragrance. The flavor of the one I chose was incomparable to what’s available the rest of the year, too. It’s also nice to get cukes without a thick layer of what looks to be my ex-college roommate’s hair wax smeared all over it, like the cucumbers you find in the supermarket. Or if not those, then wrapped in a tight sheath of plastic and twice as expensive, like the prim English cucumber alternative. As a friend who tried this afterward remarked, “The cilantro really makes this.” The distinct herb seems to be the tie that binds the sweet and savory dish together as one. Though it’s fresh, mild-tasting fare on its own, I’d recommend pouring this salad on a full plate stacked with your favorite meats, grilled veggies, and what-have-yous. 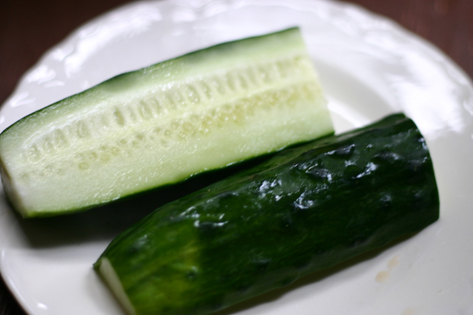 Its acidic juices help cleanse the palate and its tightly packed pellets of cucumber lend satisfying crunch. Fold all the ingredients together in a serving bowl. Cover with plastic wrap and refrigerate at least two hours before serving, to let flavors incorporate. Serve alone, as a garnish for meats or as a dip with chips. Two brownie points: Remember that keeping the green skin on a cucumber means more fiber, in addition less work and more color in your dish. I mean really, whose idea was it to give the cucumber a slicked-back Guido ‘do? Aren’t these (and apples, and — sigh — many other fruits and veggies) shiny enough on their own? But enough on that. Both the cucumber and the cantaloupe share the blessing of being low-calorie carriers of plentiful nutrients, like Vitamin A, C, potassium, antioxidants — and both are purported to have “cooling” benefits. Not such a bad plus for a summer in New York. Well, shoot. What’s so unhealthy about your delicious sounding and looking salad that makes it three whole brownie points? If I understand your brownie points correctly, the lower the number, the healthier it is. So what’s only one brownie point? Water? Me, I must be gobbling up a baker’s dozen every other day. Anyway, your yummy recipe reminds me of another salad recipe I want to try–roasted corn, mango, black beans, chipotle in adobo sauce and plenty of cilantro. I run into this problem all the time, so maybe I can ask you. I hate cantaloupe. I don’t know what it is about it, but just the smell of it makes my tongue recoil (this makes it hard to buy premade fruit salad, let me tell you, as it is usually swimming in cantaloupe juice). But I am invariably drawn to recipes that call for it, like your delicious sounding salad. 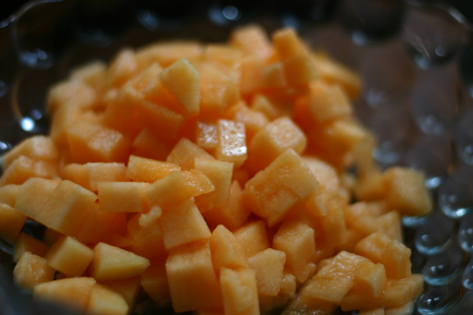 Is there anything you can think of that would make an acceptable substitute for the cantaloupe in this recipe? 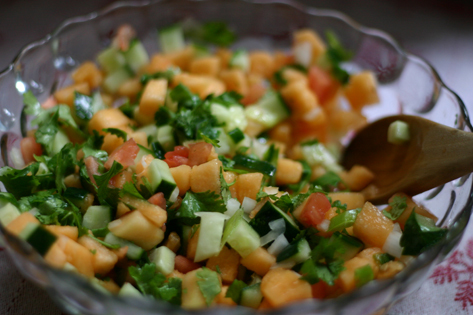 Cool – I have made a similar mango salsa to go w/ fish or chicken for years during summer, so in regard to lindsey above – switch out the melon for mango. Joyce: Shoot, you are right. I don’t know what I was thinking when I gave this 3 brownie points… I also forgot the tomato in the cost calculator. My fault. This looks like a great accompaniment to barbecued anything! You’re a great match-maker! I tagged you for a blog game; details here. i liked your melon and cucumber receipe but would like to see a presentation of such. Hey very nice blog!! Man .. Beautiful .. Amazing .. I will bookmark it. We enjoy this website given and this has presented myself some sort of inspiration to have success for some reason, so keep up the good work. I was looking over your website at: http://noteatingoutinny.com/2007/08/29/cucumber-melon-salad/ and saw the picture of the Cucumber and Melon picture at the top. The picture reminded me of Pico de Gallo and that started me wondering if the Charentais Melon could replace the Tomato in the recipe.